What does ‘being like Paris’ mean to a creative? – It means people come before cars. 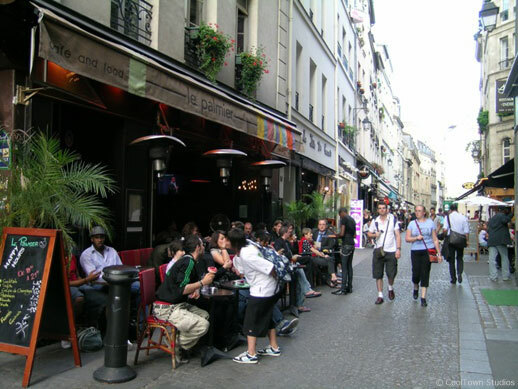 Paris is not only pedestrian-oriented, but it has several pedestrian-only districts and streets, and distributed throughout the city as well. The Marais, Montmartre, Saint Michel, Saint Germain, Bastille, Les Halles… just about every neighborhood in central Paris, home to 2 million people. – It means outdoor cafe life. You can’t walk one block in Paris without coming across an outdoor cafe – it’s the equivalent of the McDonalds and Starbucks in the U.S., except these cafes are predominantly locally and independently owned. Many of the corner cafes set up their tables and chairs auditorium style, where the street life becomes the stage. – It means feeling humane. Just about every building in Paris is human-scaled and human-proportioned, from the windows to the building dimensions – even the height. You don’t see skyscrapers, and you don’t see block block-long buildings with horizontal ribbon windows, the latter of which were inspired by the design style of machines during the industrial age. – It means food and culture. Public markets abound. It’s pretty much where many Parisians do most of their grocery shopping. Bread is baked fresh on every other block, cheese is made fresh as well, crepes are prepared live, and you won’t have to walk far before coming across a museum or theater showcasing both local and world-renowned talent. – It means craftsmanship. A lost art in many cities, because Paris’ buildings are so well preserved (and rightfully so because they’re among the most beautiful in the world), from the storefront displays to the landscaping in the parks, it feels like every detail involves the work of artists. – It means people, streetlife, even security. All of the above means you can walk just about anywhere in the city and feel alive, secure and often, inspired. Notice that the elements listed above don’t necessarily require a privileged income to enjoy. Please post your own perspectives below.